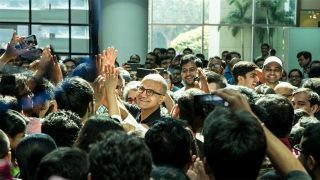 Microsoft CEO Satya Nadella is in the middle of a world tour to promote his new book Hit Refresh, in which he talks about how he's in the process of reinventing the computing giant. Right now he's visiting India, and from giving the keynote at the first edition of the India Today Next Conclave to sharing a stage with Indian cricketing legend Anil Kumble, Nadella has been eagerly spreading the word about a 'new Microsoft' which he describes as being empathetic, and an innovator that wants to help people do more. TechRadar had the chance to talk to him. It may be a playful jibe, but it's also essence of what Nadella is doing with Microsoft. He's quietly confident about the technology his company is making and eager to champion it, but at the same time he stays humble and true to his own roots. Asked about remarks he made in 2014 regarding the gender pay gap – he said women should trust "karma" and "the system" to ensure they were fairly paid – Nadella admits his mistake and adds: “It was a huge learning experience for me because the answer I gave was utter nonsense.” He also discussed changes he's introduced at Microsoft to address the issues of diversity and equal pay. “One of the things we have done […] we changed the compensation of me and my leadership team where we now have to make numeric progress. I feel there is more to be done. In fact, Melinda Gates joined Microsoft as a computer scientist, the number [of women in leadership roles] was at 35% and now it has dropped to 17% so there is a lot more to do to make computer science attractive,” he said. Reminded that he's scaled the commanding heights of Microsoft despite flunking entrance exams for the Indian Institutes of Technology and not attending an Ivy League university in the United States, Nadella emphasized how it was important to keep learning from mistakes. “I look at it and say let's have perspective," he says. "What matters more isn’t what you did yesterday but what your posture of learning is tomorrow. That’s where parents and institutional leaders can be elitist and we have to be about identifying kids and giving them the confidence to not be know-it-alls but be learn-it-alls. "It is my personal philosophy flunking exams has definitely taught me as long as I’m learning I’m fine. Failure is part and parcel of life, the question is what are you going to do about it." A bigger and more pressing issue for Nadella is that despite Microsoft’s recent success in the cloud computing business, it's still viewed primarily as an enterprise company, rather than a maker of popular and trend-setting consumer electronics like Apple. Nadella uses a question on the subject to talk about how, in his view, Microsoft is a different company to the likes of Apple and Google, adopting a tone of zen-like focus. "Whenever we have done things that come naturally to us we’ve been successful," he says. "Even if it's a consumer product it is a tool. I fell in love with Microsoft technology because of what it created. "In a way, I don’t want to take away from whatever success Apple or Google are having. We are very different companies. We are not some middleman in the marketplace. We are a tool creator, we are not a luxury good manufacturer. That’s not who we are. We are about creating technologies so that others can build." Nadella makes it clear that in order for Microsoft to win it's not necessary for Apple, Google or some other technology company to lose – it's not a zero-sum game. And he's also willing to make hard decisions in response to clear signals from the market. "You take a look at what we did with Groove and Spotify. Look at the Harmon Kardon speaker. In some sense, it is a fantastic Cortana speaker but also for Spotify. The last time I checked there were a lot more Spotify people than Groove people. So let us bring the best of what Microsoft has to a Spotify user and create consumer fans. So that’s the approach we want to take." Those comments display a hard-headedness similar to that Nadella showed in 2016 when he jettisoned Nokia’s smartphone business, which was rapidly losing ground to Google’s Android and Apple’s iPhone. Nadella is quite comfortable with the fact that Microsoft doesn’t make phones or mass-market consumer electronics. He feels it's a different type of a consumer-facing company, citing the example of the Surface line. "Even with Surface, we created a premium product and premium brand and basically said 'you know what, every OEM should create a lower-priced model'," he says. "We want to democratize things. I want to us to be proud of what we can do." Nadella is also excited about what Microsoft is doing with Windows Mixed Reality, the company's take on VR/AR, and gaming. "What we are doing in gaming, that’s a consumer for consumer franchise. We have doubled down on it in a big way, whether it is Xbox Live or Mixer, Game Pass, PC or console gaming," he says.